Take a tour through the eye to help understand retinoblastoma, its effects and treatment options. The eye is our smallest organ, averaging 2.3cm (0.9”) high and 2.5cm (1”) wide / deep. It refracts light rays to the retina, where they are converted to electrochemical energy sent along the optic nerves for interpretation by the brain. Click on the tabs below for a tour through the amazing mechanics of the eye. The white part of the eye, this tough, outer casing preserves the eye’s shape, and the inner elements. About 1/5 of the Sclera is clear, allowing light rays to enter the eye. The cornea focuses light as rays travel through its many layers. The first layer is self-regenerating epithelium that is usually cut or removed during refractive surgery and other procedures involving the cornea. This second outermost layer of the eye contains ocular blood vessels. The choroid houses the iris, behind the cornea, Together with the iris and ciliary body, it forms the uveal tract. Part of the uveal tract, the ciliary body is a transparent inner layer covering the eye between the retina and iris. The outer layer produces aqueous humor. Three sets of ciliary muscles, located above and below the lens. They shape the lens to focus on the retina. 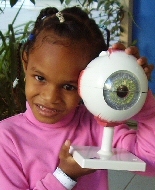 The coloured ring surrounding the pupil, the iris contains two muscles that alter pupil size. Iris colour is derived from pigment in the connective tissue. Blue eyes have less pigment, while brown eyes have much more. The sphincter pupillae muscle enlarges the iris while contracting the pupil, restricting light entering the eye. The black circle in the middle of the iris. Muscles of the iris cause it to contract and enlarge in response to light perception, and it can grow from 2mm to 8mm wide, allowing up to 30 times more light to pass through. This light-sensitive lining covers 72% of the inner eye and contains millions of rod and cone cells that convert light into messages for interpretation by the brain. Rod cells aid vision in dim light. Cone cells process bright light, and assist with visual perception, colour vision and detail. 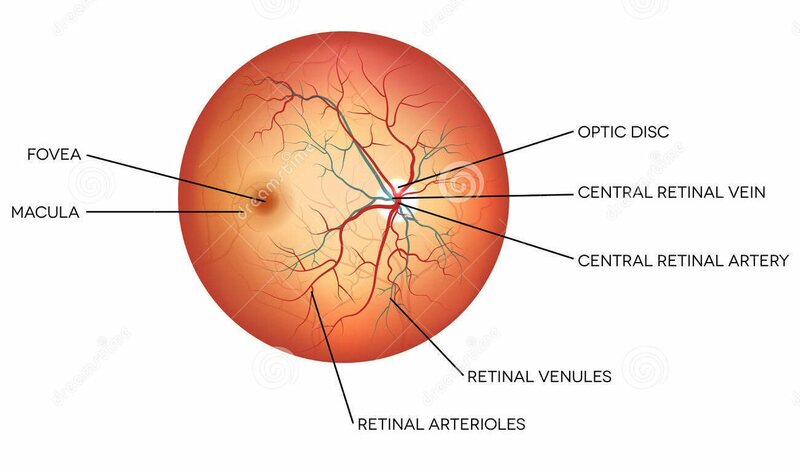 The central retina, about 5% of the retina, contains the macula and optic disc. The remaining 95% of retina is known as the peripheral retina. Only the central retina, about 2% – 5% of the entire retina, is visible with a simple red reflex eye exam performed in a general doctor’s office. The highly sensitive central part of the retina at the back of the eye, the macula controls detailed vision. The core of the macula, the fovea centralis, only contains cone cells, enabling us to clearly see very fine detail. A collection of retinal nerve fibres at the back of the eye that carry newly formed electrical impulses to the brain for interpretation. The optic nerve exits the eye through a hole in the sclera at the back of the eye called the lamina criborosa. The point where the optic nerve and blood vessels meet and exit the retina. This is known as “the blind spot” because it contains no rod or cone cells and cannot perceive or interpret light. The brain fills in the gaps for each eye’s blind spot. The centre of the eyeball contains two fluid sections, divided by the lens. The aqueous humor, the small watery front section, consists of two chambers. The anterior chamber lies in front of the iris and the posterior chamber lies behind the iris. Behind the lens is the larger, gel-filled vitreous humor, which gives the eyeball its shape. This is a narrow channel at the junction of the sclera and cornea that collects aqueous humor from the anterior chamber and drains it into the bloodstream via the anterior ciliary veins. This system is also known as the scleral venous sinus. If the canal becomes blocked, fluid cannot drain out of the eye and glaucoma develops. Cancer cells in the anterior chamber are a threat to life as there is a high risk of them spreading from the eye into the bloodstream through this canal. Just 1cm (0.4”) in diameter, and located directly behind the pupil. This clear, bi-convex structure changes shape to focus light and fine-tune vision. A moistening mucous membrane covering the sclera and inside surface of the eyelids. The tear factory, located above the outer section of each eye. Tears drain into the lacrimal sac at the inner corner of the eye, and through the nasal duct. This is why we sniff when we cry. The eye is unique in its ability to move in every direction. Eye movement is controlled by three pairs of muscles outside the eye, attached to the sclera. The Medial and Leteral Rectus move the eye inwards and outwards, while the Superior and Inferior Rectus rotate it up and down. The Superior Oblique and Inferior Oblique move the eye diagonally. Below is a diagram of the different eye muscles. The bony structure surrounding the eye helps protect against injury. Surrounding fat absorbs blows and vibrations. Eyebrows help prevent airborne moisture and other particles from entering the eye. While blinking eyelids and eyelashes dislodge and sweep away debris that may injure the eye. They also help disperse lubricating tears across the surface of the eye.